These days, no matter what type of smartphone you own, a phone case of some kind is pretty much essential. Obviously there are 1000’s of designs out there but if you want to stand out and be individual then there’s no substitute for a persoanlised phone case. 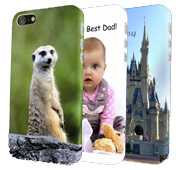 The folks over at magicyourband.com have cases for Apple iPhones and Samsung Galaxy devices. Their 3D cases allow you to wrap your own photos, logos, images and text right around the whole case which not only looks cool but provides a high degree of protection. The magicyourband.com design tool employs both Flash, WebGL and HTML5 technologies so should work on almost any device/platform. The company has provided us with discount code NOVCASE50 which will give you 50% off any phone case that you purchase. The discount code expires at the end of November 2014 and is limited to one use of the code per customer. Just enter the coupon code in the checkout to have the discount applied. Head over and check out the cases on offer!